The team finds their former Wraith ally's hive ship drifting in space, which leads them to a secret project that could turn the tide of a civil war. The Wraith are able to feed on other Wraith. It is likely that they can acquire nourishment this way, and that they do not absolutely need humans to feed on, since it is life energy that they drain and consume. The fact that we have never seen it before indicates that this cannibalism may be distasteful to the Wraith, and they only do it when they absolutely have to — or when they are fighting Wraith they consider enemies. With the Wraith back at war with one another, the fact that they can feed on one another is a very good sign for their possible defeat. The Wraith are less of a threat to the human population of the Pegasus Galaxy if they themselves are steadily reducing their own numbers, through combat and through feeding. With the destruction of the Replicators (“Be All My Sins Remember’d”), the Wraith are returning again to their infighting. A new civil war may be immanent. “Todd” and his hive were planning to use the secret cloning facility to create hundreds of thousands of Wraith, to defeat other Wraith factions. But when one of Todd’s men sold him out, his ship was attacked by an enemy Wraith — led by the Queen who took over the cloning project. The Wraith used their cloning facility to turn the tide of their war with the Ancients (the Lanteans) in their favor 10,000 years ago. Though at a significant technological disadvantage, the Wraith eventually overcame the Ancients due to their vastly greater number — as we have learned in the past (“Rising”). Now we know that the Wraith did not naturally reproduce in such great numbers. This was a deliberate strategy in order to overwhelm their advanced enemy, and it worked. This seems to indicate that the Wraith themselves are responsible for the fact that their numbers are too great for the Pegasus Galaxy’s available food supply, forcing their species in long periods of hibernation. It is curious that the Wraith were able to develop the cloning technology, but not able to sufficiently power it themselves. It is possible that they originally used a different power source, which is no longer available to them. The Wraith were able to utilize Zero Point Modules, the valuable Ancient power source. This is the first concrete evidence that the Wraith have the ability to integrate Ancient technology with their own. Though Teyla’s pregnancy is only a few months along, the mind of her unborn child has amplified her telepathic abilities. Their two minds together enabled her to take control of a Wraith Queen — something she had tried but not even come close to succeeding at before, instead allowing the Queen take over her own body (“Submersion”). The extra telepathic power also seems to be responsible for enabling Teyla to access the Wraith hive ship’s systems and pilot the craft with a great deal of ease. She herself was surprised at how effortless it seemed when she stepped up to the controls. Teyla also appears to have some level of telepathic communication with her child, as she believes that she knows it is a boy, though Dr. Keller has not told her so. Their connection is probably on a subconscious level, and would have helped to enable her to use his mental strength to engage the Wraith Queen. Teyla’s child will obviously inherit her genetic material, including the trace amounts of Wraith DNA present in her genetic make-up, which give her her telepathic gifts (“The Gift”). Just how powerful his abilities will be remain to be seen. Will Teyla be restored to full combat status on Sheppard’s team? Did the Wraith Queen manage to have any impact whatsoever on Teyla’s child? Did any of the Wraith cloning facility (or its army-in-progress) survive the hive ship’s impact? Will the Wraith return to all-out hostilities with one another, now that the Replicators have been defeated? VOTE! 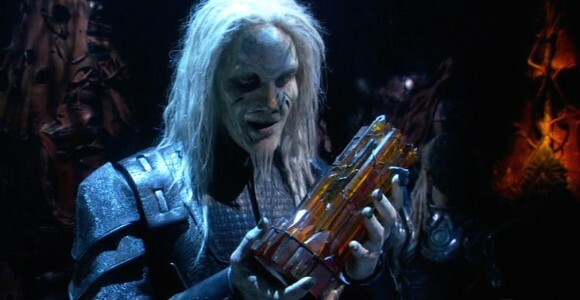 How would you rate Atlantis's "Spoils of War?"